When I was ready to get my first car as a 16 year old, I wanted a 1st gen camaro, but I had no luck finding one. I expanded my search to include 1st gen Firebirds, and I ended up buying a '68 350 automatic 'bird. I immediately realized I made an excellent decision to buy a Pontiac instead of a Chevy. I fell in love with the 60's Pontiac style. It's hard to imagine now that my Firebird was only 13 years old when I bought it. Alas, that car was stolen. I went through a series of beaters until I saved up some dough to buy a real muscle car Pontiac, a GTO. In early '87, while visiting friends in Virginia Beach, I found an ad in their local Sunday paper that said "GTO convertible with Hurst transmission". It turned out to mean a Hurst Dual-Gate controlled automatic. Despite no 4-speed, I wasted no time and went to look at it. When I saw it on the street as I pulled up to the address, I knew I would be making an offer. I offered $4200 and the deal was done. The gentleman I bought it from said he bought it in the mid 70's in New Jersey, where he lived at the time. He had seen it in a driveway sitting on flat tires for a long while and finally succeeded in getting that owner to sell it to him. After acquiring it, he had body work done which included some rear quarter dent repair, a new tail panel, and a new Linden Green paint job. He also did some engine work but I don't know exactly what since I've never had the engine apart. He turned out to be a great caretaker as he managed to save most everything original, even the AM radio. When I bought it, it had 102,000 miles. 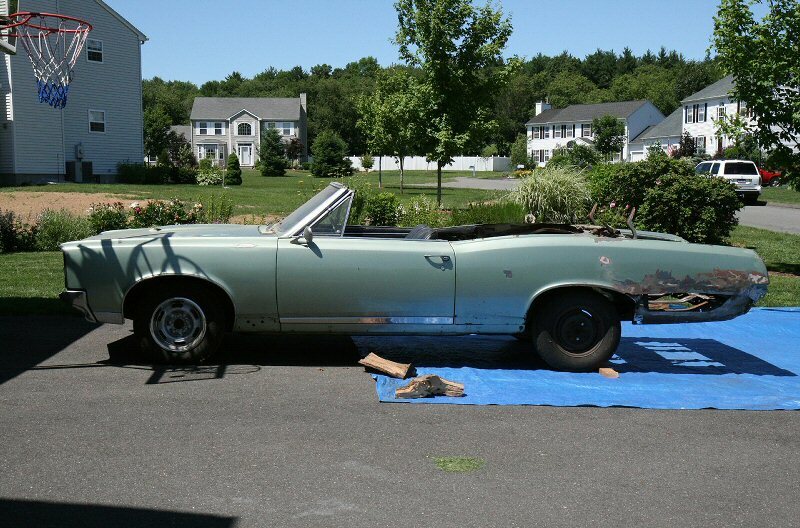 It had 1970 bucket seats, 70-ish hubcaps, and a spreadbore Holley. It even had all the original suspension parts, so I replaced the riveted ball joints and bushings. Thankfully, the frame was in perfect shape, and there were no issues with rusted bolts or scaley rust. I used to think the bias-ply B.F. Goodrich Belted T/A tires were a bit goofy, and I replaced them when I got the chance, but I wish I had a set now. I do still have one of them as a roller tire. This photo is from about 1991, after I found a set of Rally I rims at Carlisle. I think I paid an average of 20 bucks each for 'em. Also seen in this photo is a LeMans top and top frame from one of my junkyard forays. I simply unbolted my top frame and bolted in the LeMans assembly and stapled the top to the tack strips. I used the Goat as my daily driver for 3 summers and drove it everyday through Kelly Square in Worcester MA. If you know the area, you know what a demolition derby zone that is for traffic. Kelly square also happened to have one of the last gas stations which sold leaded gas in Worcester. The GTO ran nicely with no detonation on 89 octane leaded, but never ran very good even on Sunoco 94 octane unleaded. Sigh. In 1992, my GTO driving days ended when the disc brake calipers started to leak and couldn't be bled properly. The 4 piston calipers were very expensive to fix and I just didn't have the dough. So it sat. And sat. For years. It had 133K miles. I bought a Dodge Dart as a daily driver and then got into Jeeps. In 2000 we bought a new home and I had to move the car. I had a little dough by then so I rebuilt the brakes with rebuilt stainless steel sleeved calipers and new one piece rotors. For the move, I planned to have the car flatbedded since it had been sitting for so long and I had no plates on the car. But the towing plans fell through so I ended up making the 100 mile drive to my new house. What a great feeling to drive it for 100 miles after so long. At it's new home, I finally had a garage. But the previous years outside had taken their toll. The trunk rusted pretty badly from the inside out. The old bodywork started to crack and show bubbles. While some of the sheetmetal suffered, everything else managed to stay in great shape. Still, the car really deserved a full restoration. I decided to wait, save up the money, and rip it apart and restore it. In 2004 a friend bought a beautiful '68 GTO convertible which motivated me to begin messing with my car. I knew I didn't have the time and monetary resources but I just had to start something. I started with a trunk replacement in 2004 and progress was slow. The trunk installation took almost five years. Yup. 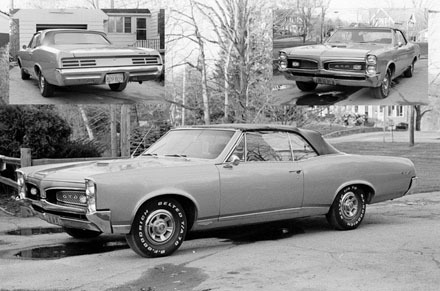 Part of the reason for dragging my feet was the hope that 1967 GTO full quarter panels would be finally released. They never came. But, since I learned alot about metal work on the trunk job, I decided to tackle the rest of the car, including the rear quarters, with my newly honed skills. In 2009 the tempo really started to pick up. For whatever reason I just started to go crazy doing all the body work patching and repair. In about 2 years I got all the steel repair work done. Then a few months were spent on the frame and suspension refurbishment, and then a few months on the engine refurb. The paint work, which included stripping on up to finish paint, took about 17 weeks of me working on it evenings and weekends. That was definitely my peak work effort; I was frequently working past midnight. The rest of 2012 and a major chunk of 2013 was spent rebuilding the car: aligning and installing all the body panels, building the exhaust, restoring and polishing all the trim, rebuilding the 4 speed muncie for a second time, and fixing all the wiring. I got the car registered and on the road in May of 2013, the first time it had been on the road in 21 years. After a few months of just dealing with more details, I tackled the convertible top. That job was wrapped up in October 2013. I enjoyed the car in 2014 with only small jobs done such an all-new-to-the-car quadrajet rebuild. I still haven't thought aboutf finishing the interior or bumper chroming. These things are on the back burner for now. 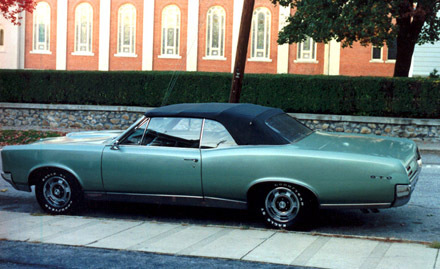 I sent away for the documentation and billing history of my GTO from Pontiac Historical Services in 2005. This is a great service which verifies the numbers of your Pontiac. It also tells you exactly how your car was optioned when built, how much the retail price was, and where it was shipped. It has a rally clock too, but it's not on the PHS docs. I wonder if the dealer added it, or someone added it early in its life. Oradell New Jersey is about 10 miles from NYC. I looked up the street view on google maps, and it seems the location is now some sort of office/professional building. Part of the fun of having an old car is the hunt for parts. I spent alot of time searching and collecting bits and pieces for the the car over the years. A major project was collecting all the parts for the 4-speed conversion. There is a risk buying used stuff and I did have to rebuild my Muncie twice. But the end result is still rewarding. I've also had fun collecting Rally I's, JA and JC code Rally II's, and now I'm looking for some correct HB code steel wheels and wire wheel hubcaps. The car will probably never be done, but that's what makes it fun.